Home » Blogs » Is CBO "Always Wrong" Because It Doesn't Understand Growth? In dismissing projected trillion-dollar deficits, National Economic Council director Larry Kudlow recently claimed that one should "never believe the CBO," the nonpartisan scorekeeping agency that recently made these projections. Kudlow claimed that CBO is "always wrong, especially, with regards to tax cuts, which they never score properly, because they don’t understand the growth, the incentives, and the encouragements to reward success." The Congressional Budget Office's (CBO) estimates do account for faster economic growth and other behavioral changes resulting from the recently-passed tax cuts, and its projections have been relatively similar to other estimates. Moreover, CBO's current projections – both of the economic impact of tax reform and the return of trillion-dollar deficits – are in line with other estimates from outside groups. Kudlow's claim that CBO does not understand "the growth [and] the incentives" of tax reform is simply not the case. CBO's models take into account many behavioral changes by workers, households, businesses, and even state and local governments. In addition, CBO's estimates of the recent tax bill take into account the macrodynamic effects on unemployment, inflation, interest rates, and the size of the economy. Specifically, CBO estimates that the recent tax bill will increase Gross Domestic Product (GDP) by an average of 0.7 percent over the next decade (0.6 percent in 2027). As a result, CBO projects $399 billion of net positive feedback through 2027, reducing the cost of the tax bill. As a result of this economic boost – as well as stimulus from the recent spending bill and overall good economic conditions – CBO estimates the economy will grow by 3.0 percent this year and 2.9 percent next year before moderating back towards the long-run growth rate of about 2 percent. Not only does CBO estimate the economic effects of tax reform, but those estimates are in line with nearly every other organization that has evaluated the bill. CBO estimates the tax bill will increase the size of the economy by 0.6 percent by 2027, which means it would increase the growth rate by about 0.06 percent per year. This estimate is higher than the initial estimate of 0.01 to 0.02 percentage points provided by the Joint Committee on Taxation (JCT) when it first scored the bill last year. It is also higher than estimates from the International Monetary Fund, Tax Policy Center, Macroeconomic Advisors, and Moody's, and it is in line with estimates from Goldman Sachs and the Penn Wharton Budget Model. While CBO's growth estimate is in line with most other estimates, Kudlow's (and the White House's) is not even close. To produce the 3 percent growth Kudlow and the White House claim can be sustained, tax reform would need to increase the growth rate by 1.1 percent per year – that's 18 times what CBO estimates, almost four times what the overly optimistic Tax Foundation estimates, and almost three times the unfounded growth claim made by tax cut advocates. And not only are CBO's growth estimates in line with others, but its fiscal estimates are as well. As we've shown, nearly all estimators found the tax bill will cost more than $1 trillion through 2027 after accounting for growth (CBO's estimate is $1.37 trillion). Additionally, CBO's projection of returning trillion-dollar deficits is in line with other estimators, including Goldman Sachs, Treasury's Survey of Primary Dealers, and even President Trump's own Office of Management and Budget, which estimates next year's deficit will total $969 billion before accounting for the recent budget deal. While Kudlow claims CBO is "always wrong," its revenue and growth estimates have actually been quite close. While no estimator can predict the future with precision, CBO's growth and revenue estimates have been as good or in some cases better than other agencies. In its recent baseline, CBO published revenue projections going back to 1981. Its average forecasting error for revenue as a share of GDP is only 0.2 percent for year one, 0.9 percent for year two, and 1.5 to 2 percent for subsequent years. The (unweighted) absolute value of its error averages only 2 percent in year one and 3.6 to 5.2 percent in subsequent years. These forecasting errors are quite small, statistically speaking. And on average, CBO has estimated modestly more revenue than what has materialized, not less. Kudlow claims that CBO is always wrong in scoring tax bills and that it does not account for behavior or economic growth. As we've shown, both are false – CBO has a strong record of accuracy, it does account for growth, and its estimates are similar to those produced by other modelers and estimators. Source: Congressional Budget Office and the listed organizations. *The Joint Committee on Taxation does not give GDP estimates for the 5th year, so we used the average for the first 5 years. 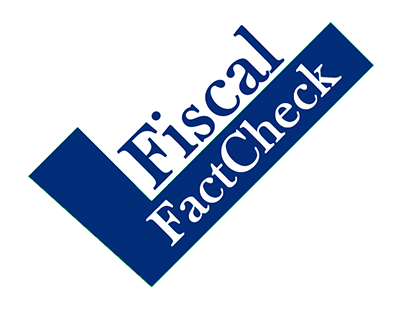 **Tax Policy Center numbers are given for fiscal years; other organizations are calendar year.